Be the first to share your favorite memory, photo or story of Valentino. This memorial page is dedicated for family, friends and future generations to celebrate the life of their loved one. 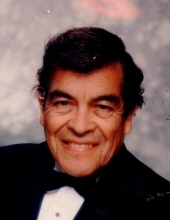 Valentino L. Barrios was born in August 1, 1932 in Arizona to parents Julian Barrios and Isidra Lopez. Valentino was a hard worker and provider for his family. During his years of employment, he worked for Di Giorgio Farms for over 20 years and then as a maintenance supervisor for the City of Arvin Water District before retiring. Valentino met the love of his life Carolina (Rivera) in Lamont and together the had 3 beautiful children. Carolina and Valentino were married for almost 52 years. Valentino spent most of his free time outdoors, he loved nature. He also enjoyed fishing, planting fruit trees, and playing with his dogs. Valentino was 86 years old when he entered eternal life on March 19, 2019 at home surrounded by his loving family. Valentino is survived by his children, Irene Paredez, Petra Moreno, Suzanne Barrios; 10 grandchildren and 20 great grandchildren. He is preceded in death by loving wife Carolina Barrios and his parents Julian and Isidra Barrios. A Visitation will be held will be held Tuesday, April 2, 2019 from 5-8pm at St. Augustine Catholic Church with a recitation of the Holy Rosary at 7pm. A Mass of a Christian Burial will be officiated by Father Jorge Robles on Wednesday, April 3, 2019 at 10am at St. Augustine Catholic Church. The Burial will follow services at Greenlawn Memorial Park Southwest in Bakersfield. To send flowers or a remembrance gift to the family of Valentino L Barrios, please visit our Tribute Store. "Email Address" would like to share the life celebration of Valentino L Barrios. Click on the "link" to go to share a favorite memory or leave a condolence message for the family.